Welcome back to the Lightspeed Review column! This month, I read The Three-Body Problem, by Cixin Liu; Lagoon, by Nnedi Okorafor; and Aurora, by Kim Stanley Robinson; and I was struck at how each novel used location and an awareness of ecological fragility in similar ways. Each book is set in a unique environment that’s outside of what I’m typically exposed to, and it’s interesting to see how each author teased out China, Nigeria, and the exoplanet Aurora (among other locations). 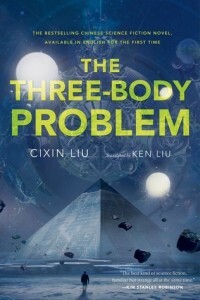 The front of The Three-Body Problem proclaims the following: “The Bestselling Chinese Science Fiction Novel Available in English for the First Time.” The first installment of Cixin Liu’s trilogy dropped last late year, with the second and third installments coming this summer and next spring. Part of what attracted me to this book was the location: Translated science fiction stories are nothing new in science fiction, and Cixin Liu’s novels will likely be the first in a much larger trend of importation of science fiction from around the world. The advantage of this is we have access to science fiction that comes out of its own unique tradition, which includes location. Starting in the midst of China’s Cultural Revolution and stretching to the modern day, The Three-Body Problem is a fantastic story of revolution and first contact. In the 1970s, a researcher in an experimental facility deep in the mountains of China discovers a way to send and detect interstellar messages, and makes contact with an alien race on a harsh world. Cutting to the present day, researchers and civilians in China are confronted with a variety of problems that undercut our basic understanding of the universe, all while a massive online game is put together to orchestrate the coming of visitors from beyond the solar system. Liu’s China is one of which I know little, and it’s interesting to look in on that vein of history. China’s Cultural Revolution is something that we are generally aware of, but only in the broadest of details: The realities of the movement are far more horrifying than we care to learn. Liu pulls back the curtain slightly on what some of life was like and the impact on the various characters who lived there at the time. But more importantly, this era of brutality and political discord helps to form the decisions and outlook of many of the characters who now have to contend with an alien invasion from another planet. Serious questions are asked in a way that I can’t remember reading about: Does humanity deserve the world we call home, or is there another species out there that would be better caretakers? The context for these attitudes comes out in the depictions of their treatment, as well as the extremely helpful translator notes (Lightspeed regular Ken Liu translated this, and the third novel), scattered throughout the book. This contextual information is useful in understanding how this story plays out, and it upended my own expectations as I read it; I look forward to having them upended once again with 2015’s The Dark Forest. 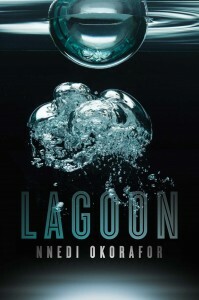 Like The Three-Body Problem, Nnedi Okorafor sets her alien first-contact novel, Lagoon, outside the United States, in Lagos, Nigeria. Lagoon was prompted by Okorafor’s objections to the portrayal of the Nigerians in Neill Blomkamp’s debut film, District 9, and evolved from there. In it, an alien ship lands in the water outside of Lagos. An ensuing wave captures three troubled characters: Adaora, a marine biologist; Anthony, a famed rapper; and Agu, a soldier in Nigeria’s army and relative of the country’s dying president. Each of the three are introduced to Ayodele, an envoy, and are then caught up in the wave of events which overtake the city and play a pivotal role in humanity’s contact with extraterrestrials. What struck me the most is how Okorafor imbues Lagos with a life of its own: The city is vibrant and contradictory, and as news of Ayodele’s arrival spreads, the city and its citizens respond in their own variety of ways. Okorafor largely splits the story between her main viewpoint characters, but branches out as needed to tell the story from a larger pool. There are several unconventional viewpoints, such as from a bat and from a spider, but also from a prominent religious figure and from a cross-dresser who’s part of an underground equality movement. Ayodele appears to be composed of nanoparticles, and can shift her form as needed: This is a highly appealing ability, and one which many in Lagos look to co-opt for their own ends. The activists see her abilities as a means or representation of what they feel, while religious individuals alternatively feel that she’s a witch, or that she’s part of God’s plan. Ayodele and those she represents have their own goals in mind as “agents of change,” looking to transform or alter the planet in a way that’s far more harmonious and sustainable. Indeed, the idea of transformation is central to this novel, and most notably, the transformation which Lagos and Nigeria undergoes is a key part of the book: The President of Nigeria (in symbolic fashion), is sick and seeking treatment abroad, only to return to be healed by Ayodele, prompting him to begin his own reforms that will revitalize Lagos and Nigeria. Each of the characters are broken in their own ways, and undergo their own transformations, literally or metaphorically, as a result of their contact with Ayodele. Lagoon is a fantastic, brisk novel that carries with it an entirely different tone and feel than that of any other first-contact novel that I’ve ever read. Okorafor deftly waves together social commentary from Nigeria and has created a vibrant Lagos: it’s a character unto itself, and one that I hope that we’ll see again in the future. 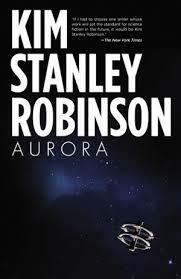 Finally, we have the latest hard science fiction novel from Kim Stanley Robinson, Aurora. Where the other two books took place in other countries outside of the United States, Robinson sets his story amongst several locations over the course of centuries, chiefly aboard a generation ship headed to Tau Ceti, a star twelve light years away that’s similar to our own. The notion of home is a frequent source of inspiration, and Robinson takes us far from Earth to impress its importance, all while breaking down many of the tropes and arguments associated with deep-space travel. Within Tau Ceti’s planetary system is a gas giant with a potentially habitable moon, Aurora, one possible destination for their long journey. The ship is beginning to experience some problems by the time it’s reaching their new home: Some elements are running short, systems are beginning to fail, and everyone is impatient to reach their destination. Not all are happy to be aboard: They were born into their lives, with no say or control over their destination, chosen for them by their ancestors. They’re angry at the failings and shortcomings that have impacted their lives. The ship, controlled by a larger AI, has its own observations of the people it carries, and watches over them as they fly to their new home. Tau Ceti proves to be a blessing and a curse: There are habitable worlds, but there are also unforeseen dangers and new problems which crop up as they arrive. Unlike the golden age novels of the 1950s-1960s, this isn’t a novel about humanity taming the wild frontier of new worlds: It’s a book about the limits of human adaptability. Robinson’s crew are part of a grand, philosophical experiment to try and spread humanity to the stars, an experiment that they find is later abandoned back at home. But, Tau Ceti and Aurora aren’t really the homes of the novel; that honor belongs to their ship, which has faithfully carried its future colonists light years from home and beyond. Robinson spends an incredible amount of time on the details of the generation ship, as both a starship and as a person, which has grown over its journey. The ship is divided into a number of biomes, each representing a small microcosm of the Earth, a tiny seed that will hopefully be planted and grown on a new world. The biomes are also what keep their human passengers alive, and as the journey continues, it becomes clear that simply replicating Earth’s environment isn’t enough. In many ways, Aurora is as much about our home planet as it is about finding and creating a new one. Earth is a wonderfully complicated system, and humanity only survives because of the tolerance for failure within those systems. On a small starship, that tolerance is razor thin, and as the ship ends its journey, a cascade of unforeseen problems have begun to arise, threatening the passengers. At many points, I found myself thinking that Aurora is what the film Interstellar should have been. There’s much crossover on the visuals, and undoubtedly, any film adaptation of Aurora would share the same shooting locations. Where Christopher Nolan’s recent film takes an optimistic tone, Robinson’s is decidedly realistic about the challenges that would face any interstellar voyager. This is a fantastic, if uneven, read that takes a hard look at the importance of the one world we know where humanity can exist. While I honed in on the idea of location for each story, what’s also important is that they’re each a first-contact story. Lagoon introduces us to nanobot aliens who crash down near Lagos; The Three-Body Problem reaches out to aliens with an invitation to visit; and Aurora brings us to a new world, one that is vastly different and more challenging than our own. Location is important to each of these stories, because it provides the needed context for why the contact was important in the first place. Okorafor’s Nigeria is an environmental mess, polluted by a weak government and callous business interests. Liu’s characters seek alien contact out of curiosity, but also as a means to give the Earth over to a species which will properly appreciate it, while Robinson’s settlers are in it for the adventure and the argument that humanity must be spread to the cosmos, to create a buffer against ecological collapse. A common thread here is the treatment of the one location where we know humanity can survive and thrive, and in each instance, we get a good reminder that our existence on this small world is very fragile indeed. 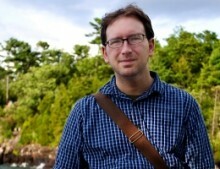 Andrew Liptak is the Weekend Editor for The Verge. He is the co-editor of War Stories: New Military Science Fiction, (Apex Publications, 2014). His writing has also appeared in io9, Gizmodo, Kirkus Reviews, Tor.com, BN Sci-Fi & Fantasy Blog, Clarkesworld and others. He lives in Vermont.